The Smooth Ride Travel System makes strolling easy with everything you need to truly enjoy your time when out and about with your baby and none of the hassles other strollers are known for. The agile wheels provide maximum maneuverability around corners, and the flip-flop friendly brakes make it simple to put the stroller into park. The canopy provides super-sized coverage and includes a special flip out visor when you want to give your child some additional protection. The canopy also features a large peek-a-boo window that gives you an easy view during the stroll and provides your little one with better airflow as they enjoy the ride. QuickClick® lets you securely attach the car seat to the stroller with one simple click, making it easy to use the car seat and stroller together as a travel system. The included onBoard™35 LT infant car seat provides your baby with a superior fit for superior safety while traveling. The 4 harness heights are spaced right to give your child a better fit all the way from 4-35 pounds. The buckle adjusts in two ways so that you can customize not only the length, but also the buckle’s position on your child. The seat has also been designed for a better reclined body position to give your baby a safer ride. Both you and your child will have room for everything you need along the way. The parent and child trays are perfect for smaller items you’ll want to keep close by, and larger items will fit easily into the extra-large storage basket. When you’re done for the day, there’s no struggling to fold the stroller thanks to the lift-to-fold design. It’s as simple as: Lift. Fold. Done. The stroller also stands when folded, making it easier to store away. With the Smooth Ride Travel System, strolling is made easy so you and your little one can focus on the fun. Safety 1st believes parenting should have fewer worries and more joyful moments. As the first and only leader in child safety, Safety 1st is here to give you peace of mind so you can spend less time worrying and more time enjoying every first you experience with your child. The travel system is GREAT. When you assemble it it's easy and you'll see how safe it is. All of it is durable, light-weight, easy to move and perfectly cushioned. Putting the carrier on the stroller is easy and secured. I like the brakes on the wheels, the big storage on the bottom, the cup carriers and tray for parent, and cushioned push handle for parent. I like the adjustable straps on both stroller and carrier, the ability to adjust the recline level and height. I really like how easy it is to maneuver, how smooth it moves, how safe it is, how comfortable it is and how pretty it looks! I like the smooth ride system because it's easy to assemble and to use, lightweight, and affordable. The car seat also works for kids up to 35 lbs which is great. It's nice to look at too - the colors are pretty. I'm using it with my twins, with one baby in the wearable carrier. Makes getting around a breeze! Two thumbs up! My mum got this for me as a gift and I love it! The people writing bad reviews must have gotten a lemon or something because I've had no issues! Usually make my husband set things up but I was easily able to construct the stroller. Took me less than 10 minutes. I did notice it 'wanders' a wee bit when pushed with one hand but so did all the other strollers I tried. Love the colours, and love how easy it is to get folded up. Makes my shopping trips less stressful. This is the perfect combo travel system for first time parents or parents with experience. Easy to use and operate! Comfortable for the baby/ child - and for your wallet! I would definitely buy this again and again! 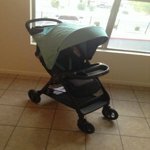 I have been using this car seat and stroller for over 8 months now and like it, although I have nothing to compare it to. The car seat is very easy to use and adjust as baby grows, and very easy to click onto the seat base and stroller, sometimes it's a struggle getting it out of the car because the lever sticks a little and you have to maneuver a bit, but not terrible. The issue i have is that the sest is bulky in the sense that when the car seat is in my car, the front passenger seat has to be moved all the way forward so there is no room for someone to sit up front. The stroller is insanely easy to fold up one handed and shove in the trunk or carry down stairs, I've even been able to fit in in the backseat of my sedan easily. Main complaint about the stroller is that it doesn't push straight and can't be pushed one handed without it wanting to "wander" a bit. The stroller is super easy to buckle baby into and adjust the seat position while he is in it. It's a good deal for the price and I would buy it again.